Les séries éliminatoires s'entament. The playoffs are starting. au football junior, les Raiders de Chateauguay vont recevoir les Jr. Riders d'Ottawa pour determiner quelle équipe finira au 2e rang du classement et laquelle aura-t-elle l'avantage de jouer sur son propre terrain lors du match démi finale pour la Coupe Joe Pistilli. Le match aura lieu à l'école sécondaire L.-P.-Paré à Chateauguay le dimanche, 22 octobre. Le botté d'envoi est à 14 heures. Le botté gagnant du match. La traduction est en cours. Désolé.. The top two teams in division 2 of CEGEP football played for the #1 spot in the standings and a bye in the first week of the playoffs and they could not be any more different. The Valleyfield Noir et Or play the ball possession style of football, using many plays and steadily advancing towards the end zone, while the John Abbott Islanders are a “big play” team, either scoring points by running just a few plays or punting the ball away. In the end, the Noir et Or, even though they executed twice as many plays as the Islanders and had a 2:1 advantage in the time of possession, needed a 34-yd field goal with only 21 seconds left on the clock to win the game 35-33. After Valleyfield punted on their first possession, the Islanders got the ball at their own 12-yd line and staying true to their character, executed a quick, 7-play, 98-yd drive that finished with I#21 scoring the first TD of the game to put the home team in front 6-0 (convert kick failed). The visitors, however, responded right away in their own style, putting together a 16-play, 108-yd drive that took almost seven minutes off the game clock, finishing with a 19-yd TD catch by V#32 to take a 7-6 lead (V#3 convert kick). It looked like the spectators, who numbered close to 1000 people, would be treated to a good old fashioned football shootout but instead both teams then settled down and played a careful punting game. The only points that were scored came on Valleyfield punts with the Islanders conceding a safety on one punt return and a rouge on another to give the visitors a 10-6 lead at the half time break. The tempo of the game picked up at the start of the second half as the Islanders scored a TD on a 32-yd catch by I#8 finishing off a rare long drive that took nine plays and went for 97 yards to retake the lead 13-7 (I#15 convert kick) but once again Valleyfield responded immediately. This time it was a nine-play, 73-yd drive that finished with a 10-yd TD run by V#32 and put the Noir et Or back in front 17-13 (V#3 convert kick). After that, it was back to the punting game just like in the first half. Mid way through the 4th quarter, however, the scoring tempo picked up again and stayed that way until the end of the game as the two teams traded the lead back and forth. First, the Noir et Or increased their lead to 24-13 with a TD on a 35-yd catch by V#88 but the Islanders replied right back on the ensuing kickoff when I#88 picked up the ball at his own 25-yd line, found a seam through the Valleyfield defense and sprinted 85 yards to the end zone to narrow the gap to 24-19 (2-pt convert attempt failed). The Valleyfield offense then stayed on the field for only three plays because of a turnover caused by I#92 who recovered the ball after the Noir et Or QB got sacked and fumbled it at the Valleyfield 47-yd line. The Islanders offensive unit then quickly took advantage of the opportunity and needed just three plays to score a TD on a 12-yd catch by I#4 to go back in front 26-24 (I#88 convert kick). The scoring frenzy then continued with Valleyfield getting into the end zone on a 7-yd run by their QB to take a 32-26 lead (2-pt convert catch by V#88) but the Islanders were not to be outdone and scored a TD on an 80-yd catch-and-run play by I#25 for a 33-32 lead with only 1:43 left to play in the game (I#15 convert kick). The Noir et Or offense then went on the field starting from their own 31-yd line and in six plays got a first down at the John Abbott 35-yd line with about 40 seconds left on the clock. After a short pass, an incompletion and a run, they were faced with a 4th down and two yards to go at the Islanders 27-yd line. 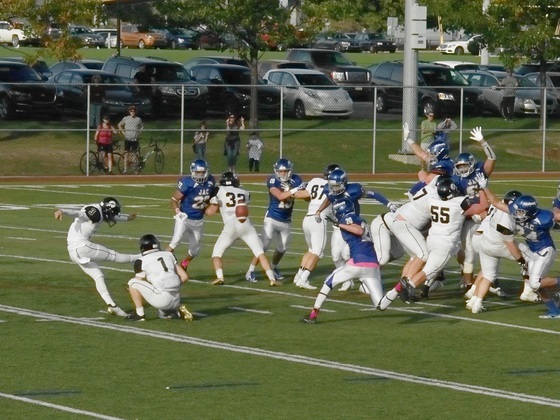 V#3 then kicked the 34-yd field goal that sealed the victory and the first place in the standings for Valleyfield. It looked good for the Stallions in the first half. They were outplaying the Hornets, generating 150 yards of offense compared to 51 for Sun Youth, creating turnovers and winning the time of possession 15 minutes to 9. However, in the second half, while the Hornets were scoring points and generating 105 yards on offense, Stallions could only generate 68 yards, 49 of which came on one passing play in the dying minutes of the game. Stallions went on offense first and had a promising drive going, gaining 34 yards in nine plays but they turned the ball over with a fumble at the Hornets 41-yd line. Fortunately, the mistake wasn't costly because the visitors had to punt on the ensuing drive. The first quarter ended without any points being scored. However, that changed quickly early in the second quarter when Stallions went on offense from their own 30-yd line. After a penalty and a sack on the 1st down, Stallions were faced with a 2nd down and 27 yards to go. That's when Stallions QB threw a short pass to S#22 who caught it at the 25-yd line and then outran the Sun Youth defenders to score a 97-yd catch-and-run TD, which became the third longest passing play in the midget team's history. Unfortunately, right after that Stallions conceded a safety, making the score 7-2 at the half time break. The start of the second looked similar to the first half, with the Hornets punting on their first possession and Stallions doing the same on their first drive. However, the turning point of the game happened on the punt by the Stallions when H#7 fielded the ball at mid field and wove his way through the Stallions players all the way to the end zone to give the visitors a 9-7 lead. Stallions tried desperately to get back in front but each one of their three drives in the 4th quarter was cut short by an interception and the Hornets took advantage of the turnovers to score two touchdowns and make the final score 23-7. On offense, S#22 stood out with 119 yards on four catches. On defense, S#99 contributed with a fumble recovery while S#19 gave the Stallions an extra opportunity to go on offense by gaining possession of the ball on a short kickoff. S#11 had an interception while S#24 led the team with the most tackles. Un reportage à suivre. Game report to follow. La traduction est en cours. Désolé. The game was over in the first half as the 21 players who played for St-Lazare were no match for the 35 players on the St-Leonard team. Both offenses had the ball six times but the biggest difference between the two teams was that the Stallions went three-and-out on five of their drives and punted the ball away each time while the Cougars scored TDs on four of their six offensive series. St-Leonard controlled the game with their strong run attack, being able to gain yards almost at will when they needed them. On defense, S#13 stood out with an interception while S#99 recovered a fumble. S#22 ans S#19 led with the most tackles. La traduction est en cours. Désolé. It took them one half of the game, but the bantam Stallions finally got their offense going, scoring five touchdowns and earning their first win of the season. Stallions got off to a great start, first forcing the visitors to punt the ball on the first offensive series of the game, and then needing just four plays to go 72 yards to score a TD on a 57-yd catch by S#80 and take an early 6-0 lead (2-pt convert attempt failed). However, they could not do much more after that and their next three offensive drives finished with a turnover. The first turnover, a fumble at their own 14-yd line, proved to be costly because the Bulldogs took advantage of the opportunity to score a touchdown on an 11-yd catch by B#81 to take a 7-6 lead (B#81 also kicked the convert). The Stallions gave the spectators a taste of things to come on their last drive before the half time break when they moved 39 yards in 13 plays and got close to the red zone but they came away empty handed as time ran out in the first half. A much different Stallions team took to the field in the second half. Instead of relying on the passing game, Stallions kept the ball on the ground, handing the ball off to three different running backs, and it paid off right away. On their first drive after play resumed, they used five runs to move 56 yards, finishing with a 2-yd TD run by the QB, to take a 12-7 lead. The Bulldogs responded with a TD on their next possession to go back in front 14-12, thanks to a 79-yd kickoff return by B#84 and a 3-yd catch by B#81. The turning point of the game happened at the end of the 3rd quarter when Stallions were on offense again and after gaining a first down just 21 yards from the end zone, they lost five yards on the next three plays and were faced with a 4th down and 15 yards to go. Instead of punting, however, they went for it and threw a pass to S#80, who caught it at the goal line and walked into the end zone to put the home team in front for good 18-14. They then went right back on offense after S#46 recovered a Bulldogs fumble and four plays later S#26 scored a TD on an 11-yd run to increase the lead to 24-14. Once again, however, the Bulldogs answered the challenge and scored a TD on the ensuing possession to narrow the gap to 24-21 with less than five minutes left to play in the game. The response from the Stallions, though, was an 88-yd drive that used more than four minutes of playing time, using one pass play and eight running plays and ending with a 21-yd TD run by S#44 that made the final score 32-21 (2-pt convert catch by S#25). S#80 stood out on offense with four catches for 113 yards while on defense, the players who stood out were S#50 and S#56 with one INT each and S#46 with a fumble recovery.